I watched The Sound of Music live broadcast on NBC last night. It was really neat that they did a live production of it like that. It was good, but not as good as I thought it would be. Perhaps my expectations were too high. The Sound of Music is one of my favorite movies and I've had the words of every song memorized since childhood, and no one will ever top Julie Andrews in the role of Maria. Carrie Underwood is not a very good actress, but she sang well. I don't want to criticize it too much because I really am glad they did it and it's not like they were trying to outdo the original. (Although having said that I think the Mother Superior and Leisl were even better than the originals!) 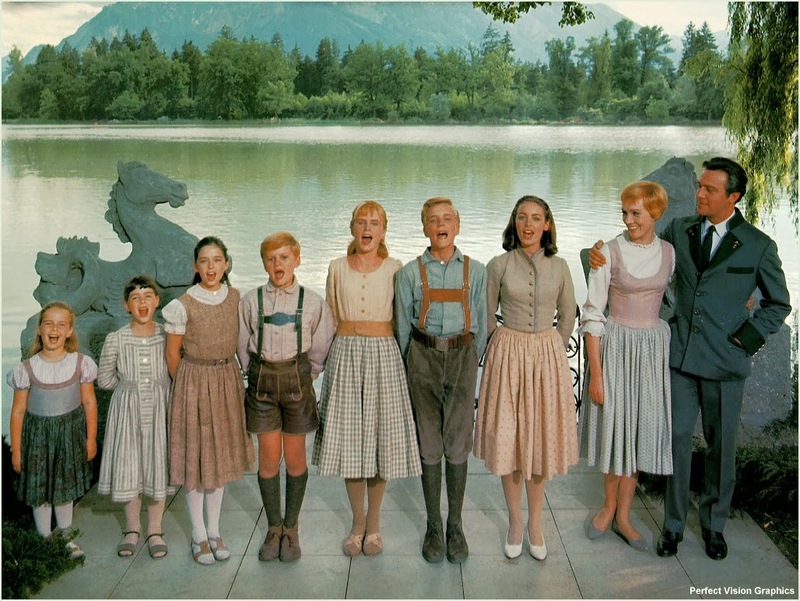 I need to watch the real Sound of Music again soon (it's been a few years) and introduce my kids to it! Speaking of Julie Andrews and "practically perfect in every way," another classic movie that I love (and know all of the song lyrics to) is Mary Poppins. 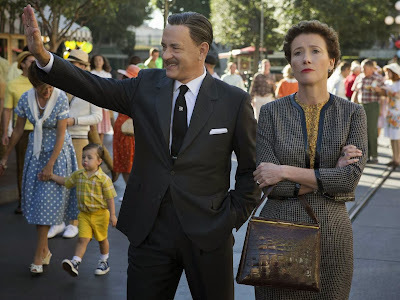 So I'm excited to see the movie Saving Mr. Banks this month because of that. Peter and I went to the Mary Poppins Broadway musical in Des Moines three years ago, and it motivated me to read the book by P.L. Travers. 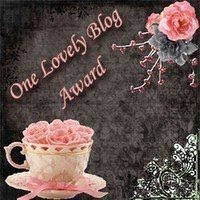 (You can read my review here.) 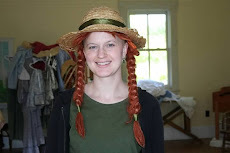 I was surprised by how dark and joyless the book was, which lead me to do some googling of Travers, and what I found made me lose a lot of respect for her. According to the things that I read, she wasn't a very nice person. She apparently hated what Disney did to Mary Poppins (they made it much, MUCH better than the book, and she disapproved). So I'm eager to see how this is all portrayed in the movie. 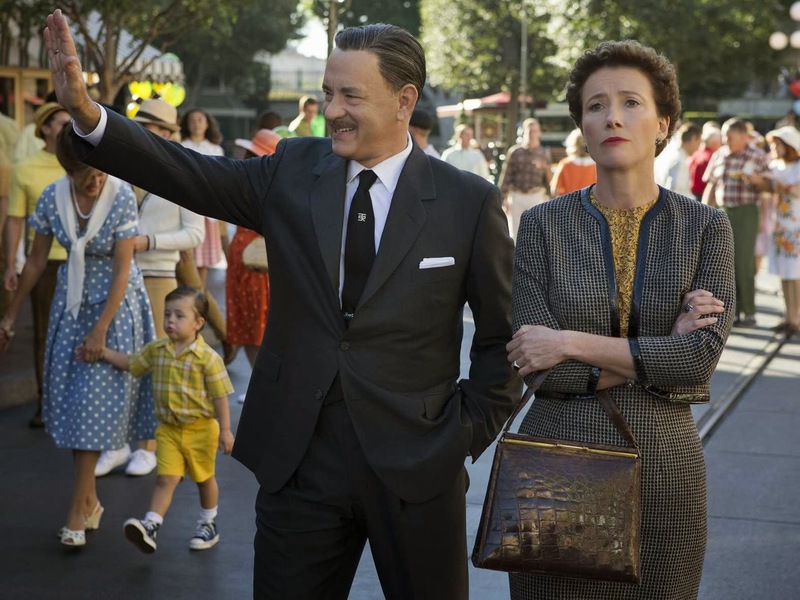 I bet Tom Hanks will make a good Walt Disney, and Emma Thompson (who will be playing grumpy P.L.) is one of my favorite actresses. Maybe she'll help me to understand Travers a little better. 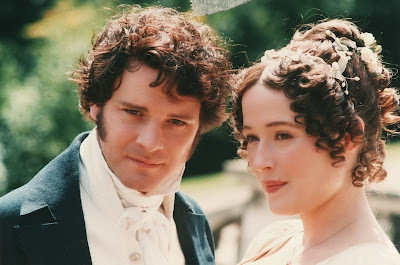 You're going to think that I spend most of my time watching TV and movies (I really don't!). 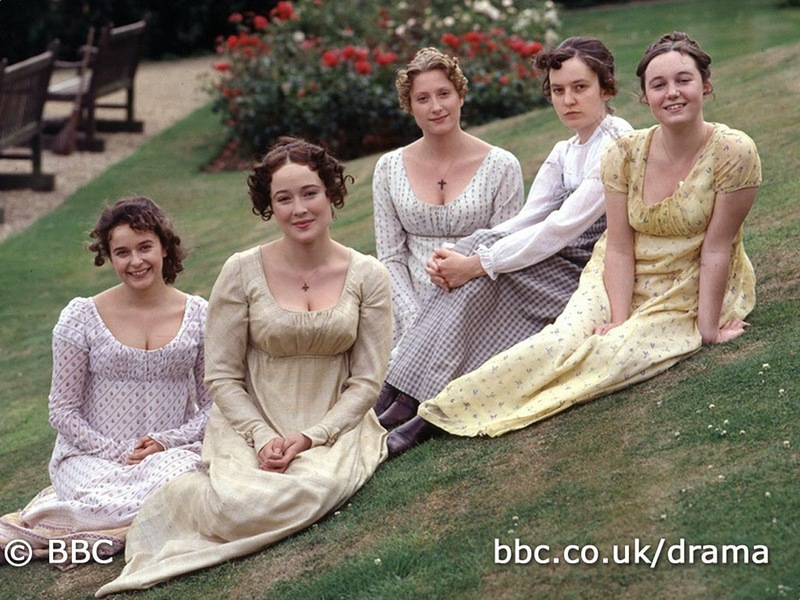 But last weekend I watched the five-hour BBC/A&E's production of Pride and Prejudice because this year is the 200th anniversary of the publication of Pride and Prejudice. 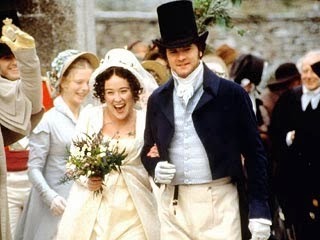 If I were really good I would have re-read it, which I wanted to do, but it's nearing the end of the year and I figured the long version of the movie was going to have to suffice. And boy, does it! 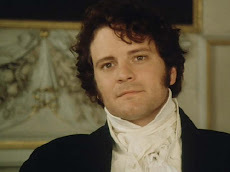 Colin Firth is the best Darcy ever! Jennifer Ehle is perfect as Elizabeth Bennet too. I found the Christmas sweater that I wanted that was sold out on target.com. The brick-and-mortar Target had it! I'm not exactly sure why I like this sweater so much but I do. I think it's funny! There was this funny cat lady Christmas sweater there too that was tempting. Maybe next year! I really must be getting older to find these things so funny. But at the same time, these sweaters were in the Juniors section. So maybe I'm just immature. If you watch only one funny YouTube holiday video this season, let it be this one of Captain Picard singing "Let it Snow" (although those words aren't ever actually said...you'll see). Even if you're not a Star Trek fan, you'll like it. Watch until 1:10 (after that it's an ad). Very funny! I was finally going to do a post about our house on Cape Cod this week, including many pictures which friends have been asking to see, but I decided to do the Christmas decorations post yesterday instead, so I'll post about the Cape house sometime in January when I start blogging again. In order to simplify and feel the peace of the season (and watch more TV and movies, ha ha, just kidding) I'm taking the rest of the month off. I hope you have a wonderful holiday! Cheers to a very good 2013 and here's to an even better 2014! 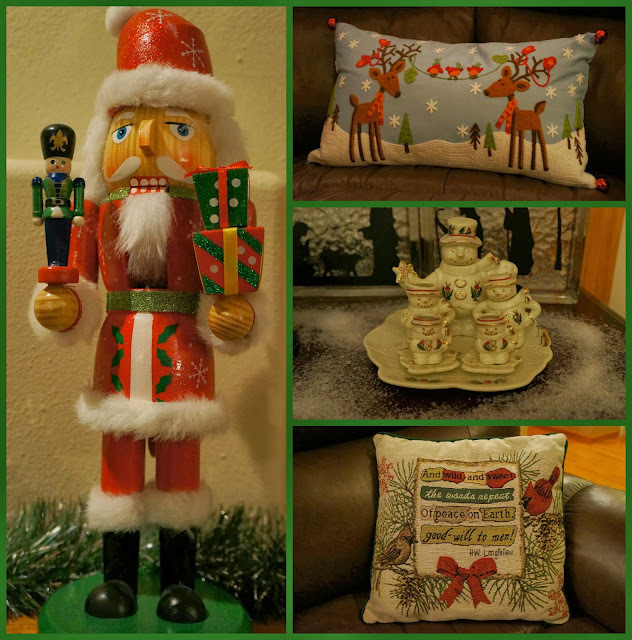 It's kind of fun to do a post about decorating my house for Christmas because I haven't done a post about that in a few years. Usually there's an extra week before Christmas so the tree's not done or the decorations aren't all out by the time I stop blogging for the rest of the December, or I don't upload pictures from my camera until the end of the month, and who wants to post about their Christmas decorations in January? 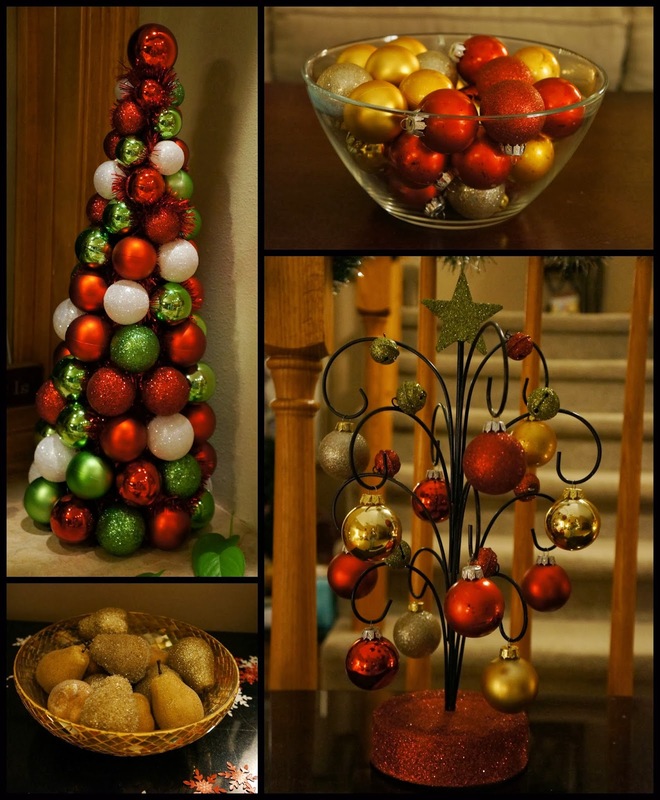 So I'm going to take advantage of the fact that the halls are decked and post about it today. Our decorations really aren't anything fancy, but they're fun and festive and special to us! So we start with the tree. Then string up the lights--white lights this year. Yay! Then put on the ornaments, of which we have many (too many!). The kids stay interested in doing this for about five minutes. But finally we're (I'm) finished, including the star at the top getting straightened out (the stepladder wasn't tall enough so I had to go and get the big ladder and do some creative cutting of the branches at the top to get that star to stand straight! ), and it all looks very pretty. And the lovely pine scent smells so nice. I wish we could have a real lit tree like this in the corner of the living room year-round! It fits there so well, and reading by the light of a fragrant Christmas tree is one of the great pleasures of life. I'm going to start with my oldest and most humble decoration. I made this reindeer when I was six years old. I clearly remember feeling so frustrated and upset while I was making it because I kept messing up. As you can see I smudged the paint on one of Rudolph's eyes, and I glued the back part on wrong and it had to be torn off and glued on correctly, among other errors. I hated it, yet now with the seasoned (get it?) eye of experience and maturity I embrace it and all of its imperfections. It's become one of my favorite things to pull out each Christmas season. This porcelain village is one that I grew up with in my house at Christmastime. My mom gave it to me a few years ago. Someday I'd like to decorate the mantel elaborately like the ones on Pinterest, but for now, I like the simplicity of it. The stockings are indeed hung by the chimney with care! This Thomas Kinkade Christmas tree is one of my favorite decorations. It was a gift from Peter's parents a few years ago. I like to wrap the banisters with garland. The only downside is that they look really stark and bare for awhile after it gets taken down! 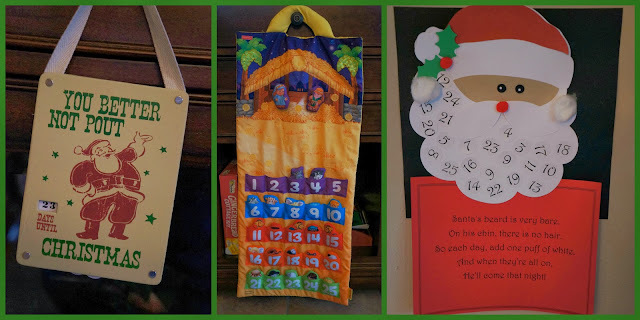 Our countdown activities! I get more excited about these than the kids do; what the heck!? I love this set by Willow Tree. My mom has been gifting me with pieces for it for the last few years. In fact, I just got some new pieces in the mail today! 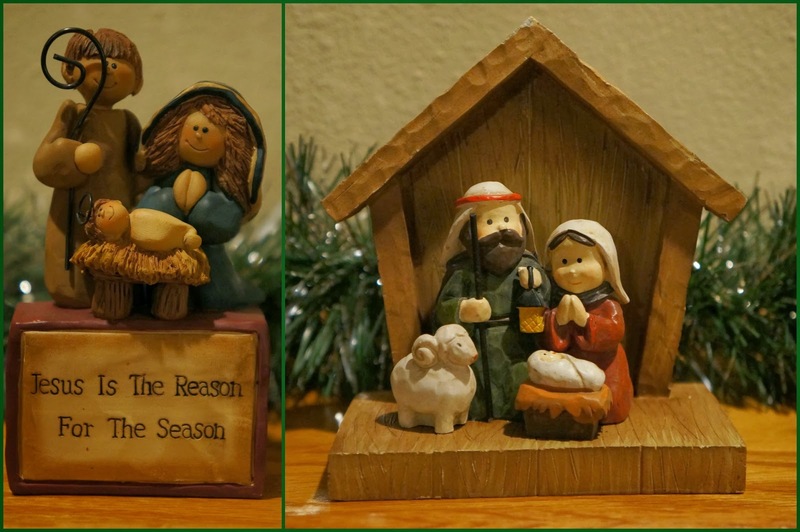 I made this set of Nativity blocks a few years ago in Connecticut at a Relief Society activity. 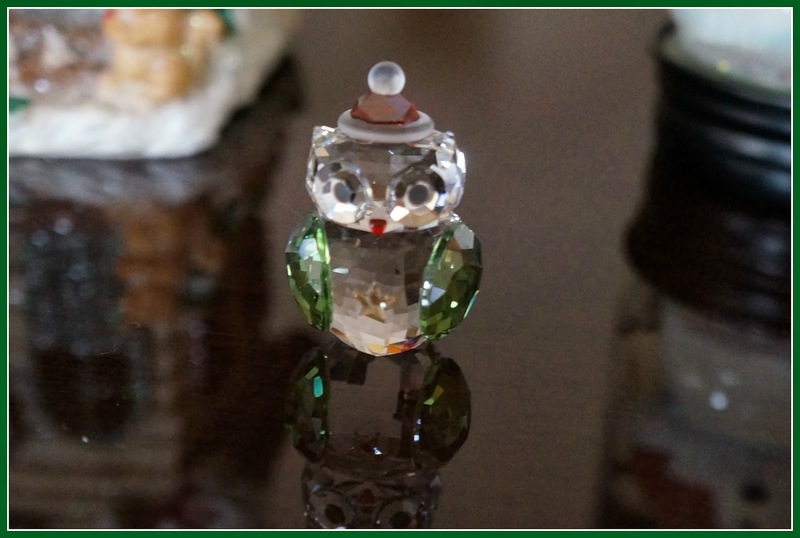 Peter got me this adorable little Swarovski crystal owl at the Swarovski store in Manhattan last year. My all-time favorite Christmas candle is "Red Berries & Cedar" from Yankee Candle. I get a big jar of it every December. A beautiful tree by day and by night! Our ward Halloween party was held two days after Halloween this year, which was a fun way of extending the festivities. Sam's face cracks me up in this picture! 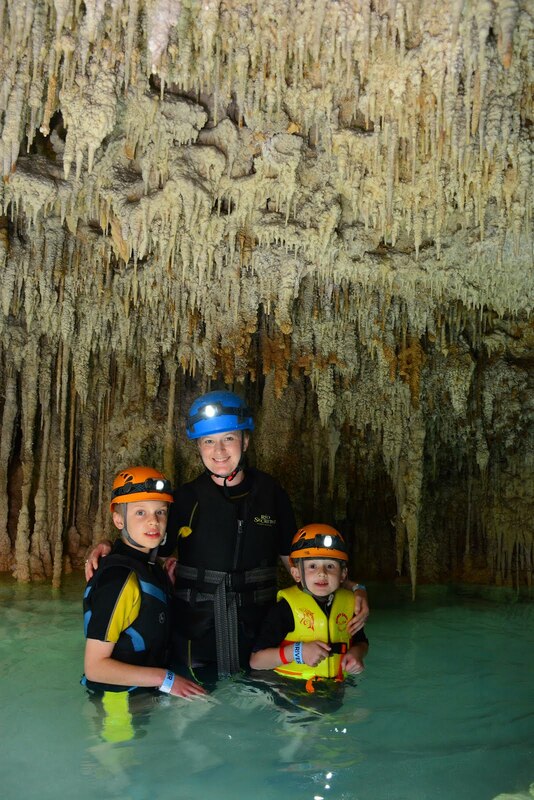 John and his friend Hyrum sporting their vampire teeth. 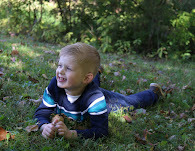 Sam's been into collecting rocks this fall. He takes them from the landscaped areas around our house, and he'll triumphantly return from preschool with a pocketful of rocks that he picked up from the playground. He had fun painting the biggest rock in his collection. This was a tree in our backyard on Saturday, November 2nd. I was reading a book and looked out the window and the leaves' beautiful bright autumnal colors were glowing in the afternoon sunlight, pretty much begging me to take their picture, so I went outside and did just that. And on Saturday, November 9th, exactly one week after I took the first pictures, it looked like this. 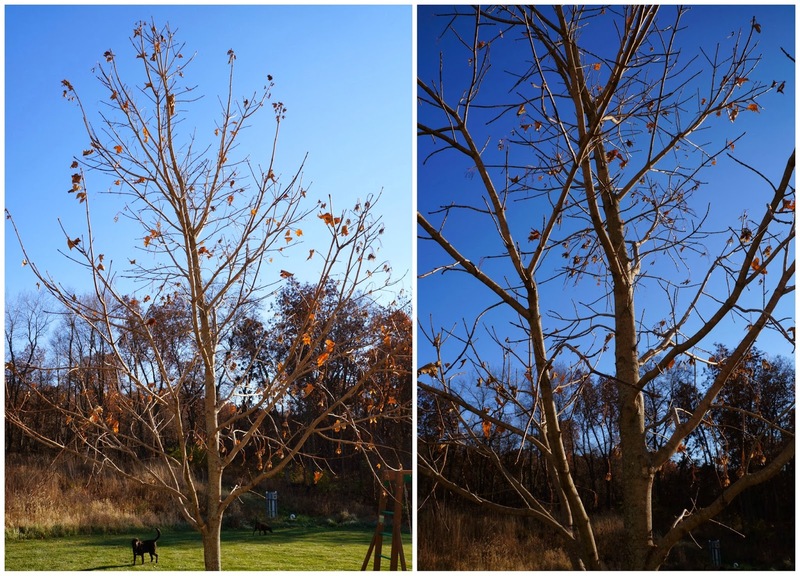 What a difference one week makes in the late fall! Playing on the iPads. What was life like before iPads? I can hardly remember. John was reading for pleasure, and I had to document it! Thank you, Jeff Kinney, for your Diary of a Wimpy Kid books! Pokemon cards. I still don't get how to play. Can you guess what John wants for Christmas? It snowed and stuck around on the ground for awhile this time! 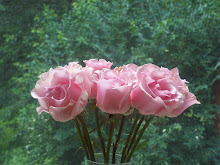 Peter got me the prettiest bouquet of pale pink roses and they bloomed beautifully. 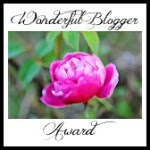 I love pale pink roses so much that I decided that was the only flower I wanted in my wedding bouquet. I get a little obsessed with taking pictures of blooming roses so I'll probably give these a post of their own at some point! Sam built a rectangular train track on his own. He was so proud of himself. We're impressed with some of the creative tracks that he comes up with! I got these adorable white owls at Target. I couldn't resist their fluffy soft white wings and eyebrows. 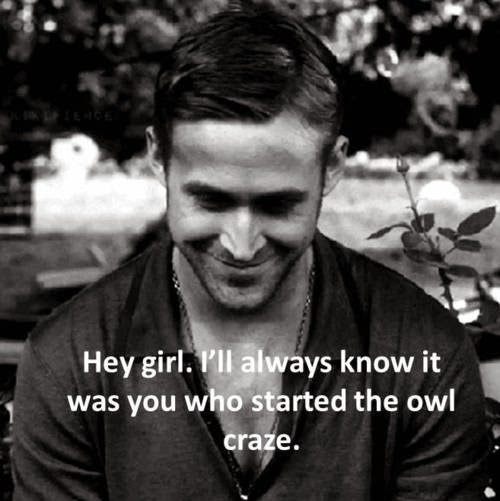 Aren't they cu-hoot? (sorry) But really, aren't they? Sam's turkey handprint from preschool. 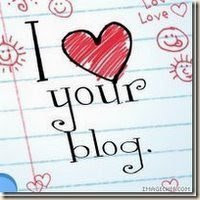 I love things like this. There was a lovely sunset the evening before Thanksgiving. 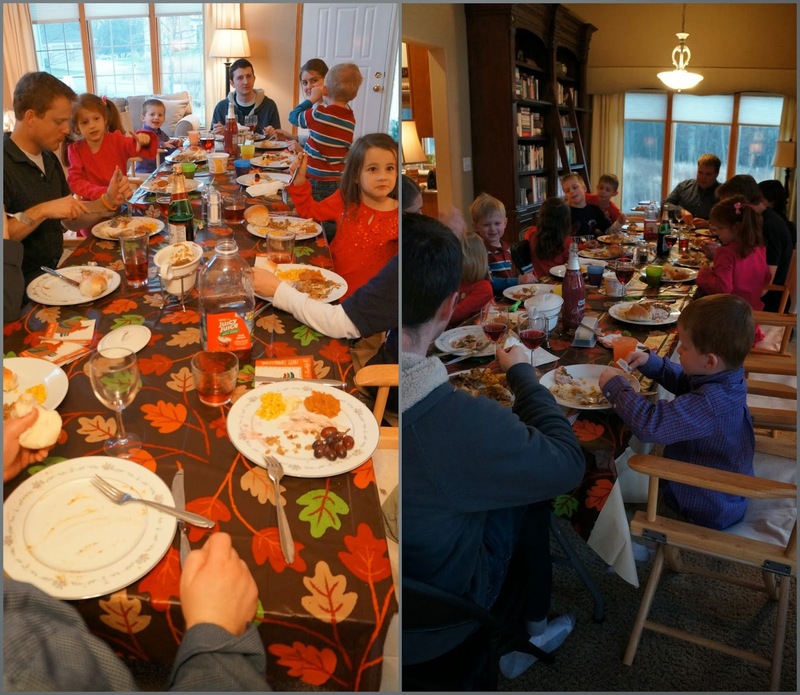 We hosted Thanksgiving dinner for a big group for the first time ever. It was both easy and challenging (if that makes any sense), but it was fun. We had two families over for a total of six adults, eight kids, and one baby. Peter wasn't feeling well in the morning and he was in charge of cooking and stuffing the turkey, so our food preparation schedule was off to a late start, and then I got tired and laid down for too long, so not everything was ready when everyone arrived. 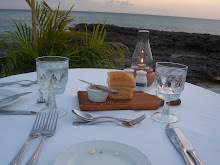 But luckily we had appetizers to tide us over until it was time to eat. I went back and forth about assigning seats and using place cards or letting people decide where they wanted to sit when they got there. I went with the latter but next time I'll go with the former. John was happy with the way the seating turned out. He got to sit between two of his favorite friends from church, Ellie and Hyrum. The day after Thanksgiving we went and picked out our Christmas tree. We've gone to the same place to do this since we moved here because it's a great place to get a tree. It has a good selection of trees and a cool needle-shaking machine and netting device that the trees go through, and then they tie it onto the roof of your car for you. There's also a fast, rickety little train that's fun for the kids to ride on, and a little cottage where they sell hot popcorn, hot apple cider, hot chocolate, and baked goods...it's like this little wooded winter paradise in the middle of farmland. We don't go out and cut down our own tree. That's too much work! We like to select from the pre-cut ones. We ended up getting the first one I spotted when we drove in. 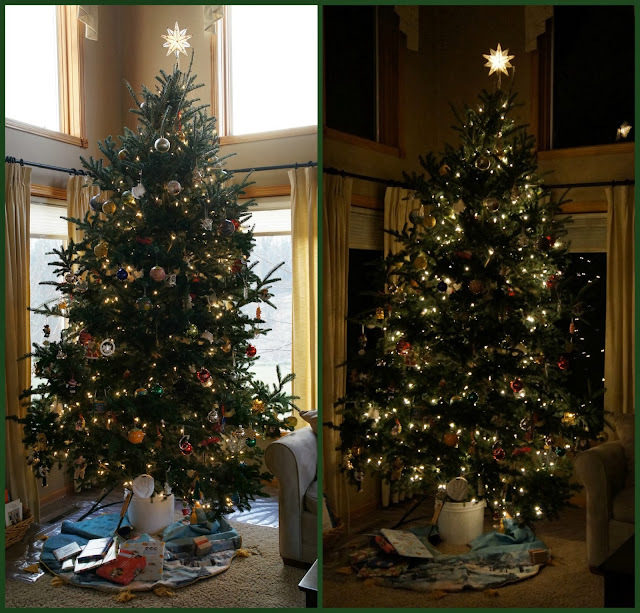 We didn't realize it at the time, but it turned out to be the tallest tree we've ever gotten. John and Sam riding the train. Sam rode it three times. Then we got the tree home and set it up. The kitties always get excited about a tree in the house. From fall foliage to Thanksgiving to Christmas trees--that's the nature of November!